With the advertising industry up in arms yet again around the minimum online viewability standard, Australian media academic, Professor Karen Nelson-Field, University of Adelaide and her colleague, Dr Erica Riebe, have made some global waves with their latest research that challenges the status quo. The current viewability standard is a two-part metric based on the proportion of pixels in an advertisement that are displayed on screen, and the length of time for which they appear. For online video, at least 50 per cent of the video must be visible for at least two continuous seconds to be counted as a ‘chargeable’ view. But in the September issue of WARC, Nelson-Field challenges the minimum threshold set in 2014 and questions the impact on advertising effectiveness when only 50 per cent in view is considered acceptable. “Our research was based on the sensible premise that if an audience can’t see the ad then how could it possibly make a difference,” Nelson-Field said. 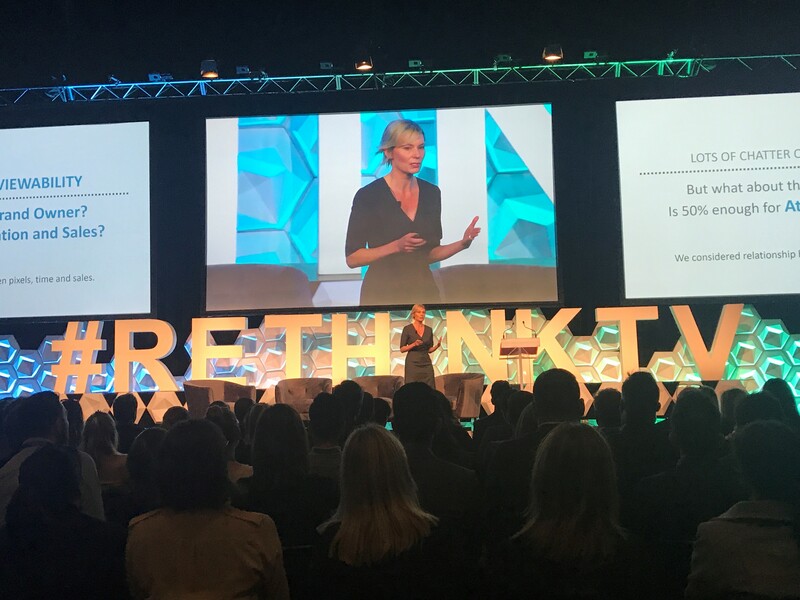 Professor Karen Nelson-Field at ReThink TV this morning in Sydney. She suggests that while there has been a huge amount of work done to consider viewability with regard to transparency and ad fraud, very little work has considered the real impact on sales and attention when an ad is seen at less than 100 per cent. “Bringing viewability standards to market has brought accountability to an unaccountable industry, and the MRC and its partners should be commended for their ability to rally an industry so quickly. However, our research takes the side of the advertiser and quite simply considers whether a higher threshold would deliver more sales to advertisers,” Nelson- Field said. The current minimum threshold standard does drive an impact, but there is material uplift in sales above 50 per cent pixels and two seconds. Pixels matter the most as gains in sales come more from increases in percentage of pixels on screen than from time on screen; the impact split around 70:30. 100 per cent pixels consistently outperforms the standard, by twice as much, regardless of time on screen. This research is part of a bigger study using bespoke technology including ad tagging and eye-tracking software, exposing 2583 Australians to some 18,219 advertisements under natural viewing conditions in the home. Respondents were then tasked to go shopping in an online shopping mall, where they were able to consider up to 38,745 different brands including the ones they were exposed to in the study’s advertising. According to Nelson-Field, “The nature of the technology, and the scale of the study, meant we could measure other metrics that are related to opportunity to see. We considered the proportion of the screen that the ad occupied in addition to the proportion of ad pixels on screen. This helped us understand whether distractions on screen hinder the sale regardless of the proportion of pixels displayed. “We found that coverage extended the impact of pixels. So 100 per cent pixels covering a larger proportion of the screen has a greater impact (in sales) than 100 per cent pixels covering a smaller proportion of the screen. At a bare minimum, the authors suggest this research calls out the need for the global industry to review the current MRC viewability standard for video, advancing new criteria that acknowledge the interests of brand owners. Equally, Nelson-Field says this research highlights the need for industry to think about a more advanced future currency that transcends media type and includes a heavier weighting to visibility as a consideration of both pixels and coverage.